Identifying plum trees by their leaves alone can be tricky, but is possible with careful observation. Plum trees are deciduous and unfurl their fresh green leaves in the mid to late spring after flowering has commenced but not finished. 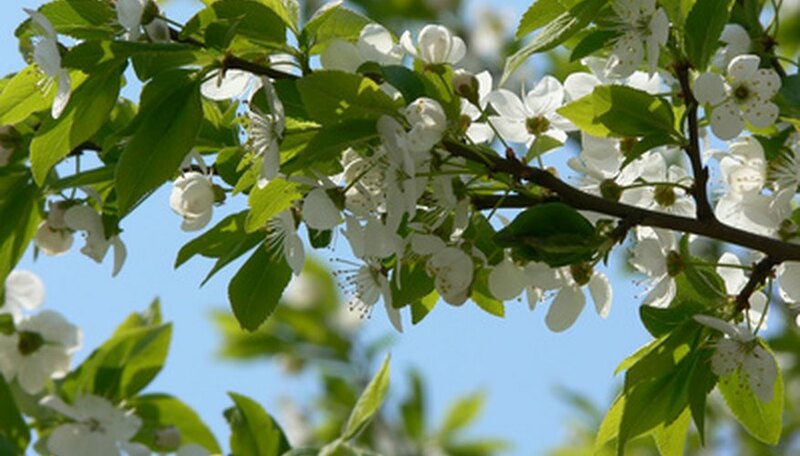 You will often see a tree laden with white blooms as the green plum leaves begin to fill in among and behind the flowers. The leaves will often turn golden or red in the late summer or early fall, remaining on the tree into roughly mid to late fall, when they will desiccate, turn brown and be shed to the ground or wind. Look for medium tone green leaves that are ovoid in shape with a pointed tip and are roughly 2 to 4 inches in length when measured at their longest point, from stem joint to central tip. They will be 1 to 2 inches in width at maturity when measured at their widest point. Look for leaves with a central vertical vein running from the stem joint to the tip of the leaf. There will also be side veins, thinner if diameter than the central vein, that radiate out from the central vein, drooping downward slightly, orienting toward the tip. Inspect the edges of the leaves, called margins, for a serrated or slightly sharp-toothed appearance and feel. Flip over the leaves and look for either a smooth or slightly hairy surface texture, which is common to plums.